Dancing Skyscrapers Active lines elementary art lesson teaches students about line and the artist Janet Karam. There are 5 types of lines: horizontal, vertical, diagonal, zig-zag and curved. Horizontal & vertical lines give off feelings calmness. Active lines are zig-zag, curved and diagonal lines. How to make a building look 3D. We studied the artist Janet Karam & her “Funkytown” Series of abstracted cityscapes. Some of her art can be found at the Mary Karam Gallery. Draw buildings in PENCIL using the 3 kinds of active lines. Use 3D techniques to make the buildings look 3D. 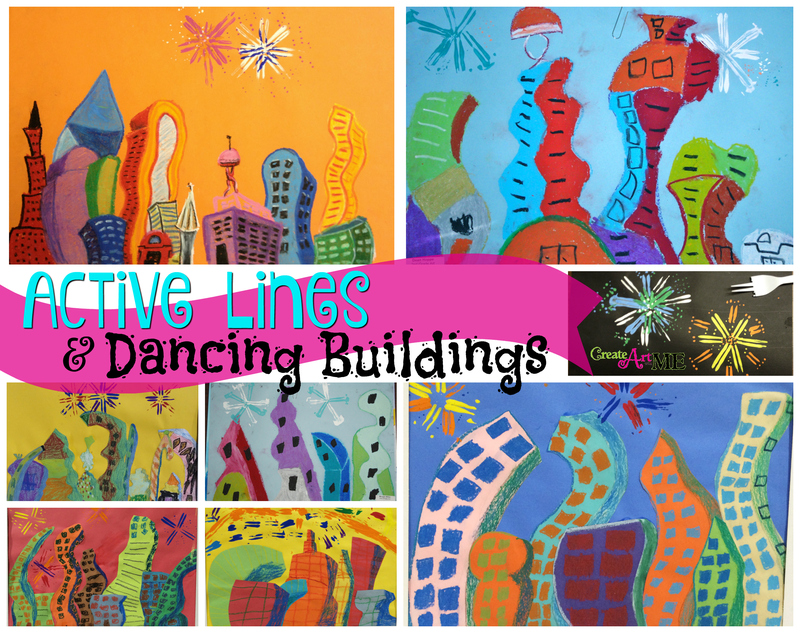 Outline all lines with oil pastels-each building a different color. Using 2 values of each color (a light & a darker value), color the front of the building the light value & the side of the building the darker value. Use broken forks (2 prongs together) & tempera paints to paint in fire works.